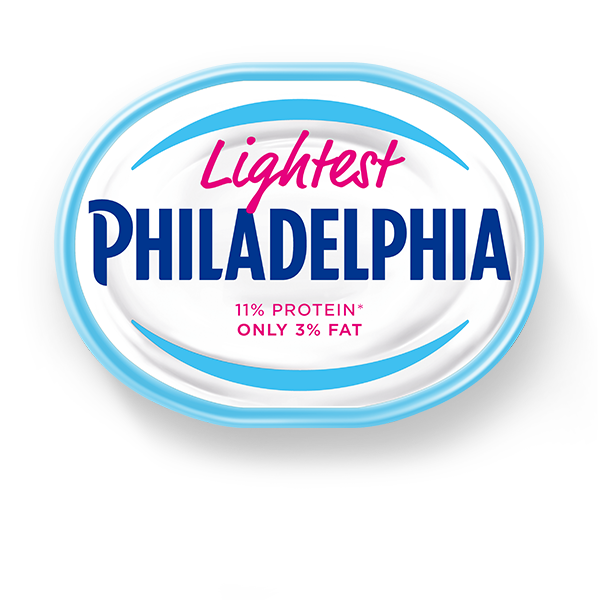 Made with milk and real cream, Philadelphia Lightest has only 3% fat and is packed with 11% protein. Spread it over crispbread and top it with fresh cherry tomatoes for a wholesome snack, or spread it over wraps as a delicious and healthier alternative to sour cream or mayonnaise. For a protein packed lunch, try it topped with grilled chicken and lettuce. Philadelphia is fantastically versatile, whether you are looking for a guilt-free snack or a delicious high protein lunch. See our recipes for more delicious inspiration. Made with pasteurised milk and with no added preservatives. Suitable for Vegetarians. Low Fat Soft Cheese, Salt, Stabilisers (Carob Bean Gum, Carrageenan), Acidity Regulator (Citric Acid).